Mongolian beef is a dish served in most Chinese restaurants. The dish consists of tender slices of beef, a great array of stir fry vegetables in a savory brown sauce with the perfect combo of fresh garlic and ginger. 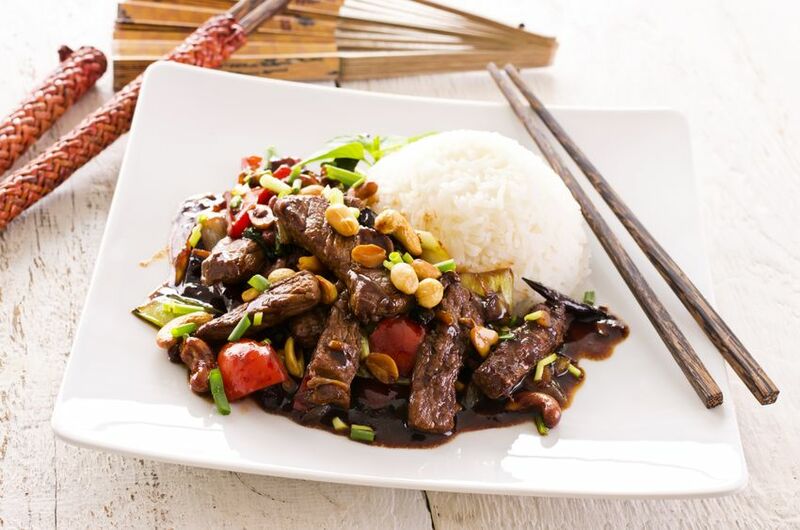 The tasty beef is generally served over steamed rice or crispy pan fried noodles. Now the thought of making Mongolian beef might be rather intimidating. However, stir fry beef recipes are truly a breeze to make. In truth, all that needs done is to prepare the vegetables and then fry them. The secret to great Mongolian beef is in the timing, the delicate balance of spices and an easy technique called velveting. The cooking art of veleveting involves marinating your beef in sherry, egg white and cornstarch. The special marinate process is what preserves the moisture of your meat. So for the perfect meal, this Mongolian beef recipe includes a quick and easy version of velveting. Although the technique time is shortened, the beef turns out very tender and moist from the rich reduction of brown sugar and soy sauce. Once you learn how to make Mongolian beef, it will become a favorite quick and easy meal. As a matter of fact, this Mongolian beef recipe will be better than your favorite Chinese restaurant version. It is a great meal to serve for small get-togethers; it is guaranteed to impress your visitors. And for a nice variation, stir fry beef recipes are effortlessly suited for vegetarian or chicken versions. For a vegan or vegetarian meal, substitute the beef with tofu or other meatless proteins. Heat about 2 teaspoons of oil in a small saucepan to medium-low heat. Stir in minced ginger and garlic. Sauté the mixture for 2 minutes or until it is golden in color. Mix in the soy sauce and water. Add in the brown sugar. Increase heat to medium. Bring the sauce to a slow boil, cook about 3 minutes. Remove from heat and set aside. Slice the beef against the grain into ¼ inch pieces. In a large bowl, add the cornstarch. Toss in the beef. Make sure that all the beef is coated with cornstarch. To remove excess cornstarch, put the coated pieces of beef in a sieve and shake. Allow the beef to rest 10 for minutes. In a large wok or heavy saucepan, add ½ cup oil and heat to medium-high. Do not allow the oil to smoke. When the oil is hot, add the beef and sauté for 2 minutes. The beef needs to be seared on all sides and barely cooked in the center. With a slotted spoon, remove the beef and place on a plate lined with a paper towel. Remove any excess oil from the wok or skillet. Reheat the wok or saucepan to medium heat. Add the prepared sauce and allow it to come to a boil. Stir in the beef and cook at a boil for 2 minutes. Stir continually to prevent burning. Mix in the scallions. Using a slotted spoon, remove the Mongolian beef and scallions and place them onto a plate. Serve with pan fried noodles or steamed rice. Cornstarch needs to come to a boil in order to thicken.